Catrina Zentner grew up in southeast Nebraska graduating from Southeast Consolidated High School. In 2003, Catrina graduated from Bryan School of Nursing as a Registered Nurse. As a new nursing graduate Catrina worked at Community Medical Center in Falls City followed by Kansas Dialysis Center before coming to ESU 4. 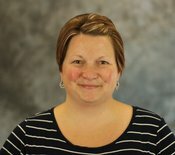 Catrina has served as the Director of Health Services for ESU 4 since August of 2006 working with the health needs of student’s birth – 21 in southeast Nebraska. In 2009, Catrina graduated from Nebraska Methodist College with a Bachelor of Science in Nursing. In 2012, Catrina graduated from the University Of Nebraska Medical Center with a Master’s of Science in Nursing Informatics and Administration. Catrina lives near Verdon on their family farm with her husband Cole and boys Colt, Cale, and Cy. Colt and Cale participate in 4-H in Richardson county. We enjoy helping take care of the cows, dairy cows, and pigs. We also enjoy spending time in the tractors and combines. The boys are active in city rec sports. I enjoy spending quality family time together taking care of things around the farm, attending sporting or music events, or camping and boating. My main goal is to focus on meeting student health needs. I’m here to help anyway I can. I am happy to assist parents and families with finding resources for their health needs! I can be reached by calling 402- 414-3040 or emailing czentner@esu4.net.